I was incredibly lucky to be taken to Phuket recently by my boyfriend (who also happens to be my Artistic Director - so these stunning photos are all his!) 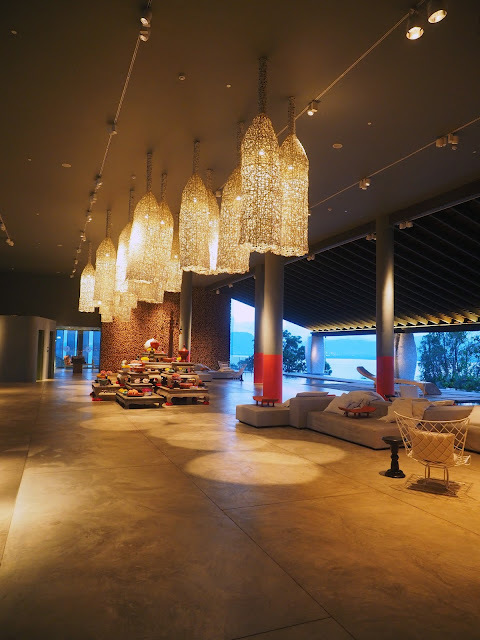 for a birthday weekend getaway - and even more so because we stayed at the new luxury resort, Point Yamu by Como, on the far East coast of Phuket. The resort is located around 25 minutes drive away from Phuket International Airport at the very end of Cape Yamu, which is far removed from the rowdy crowds that usually flock to Phuket. It is part of a larger luxury complex that houses villas both for sale and rental (from two bedrooms up to four bedrooms) - so pop by for a tour if you have a few million US dollars to spare! What is most unique about this resort is that all rooms and facilities have a sea view, owing to the hotel's rare location where it is surrounded on almost all sides by water. This means that every single room and villa opens up to a waterfront landscape with a panoramic water view. 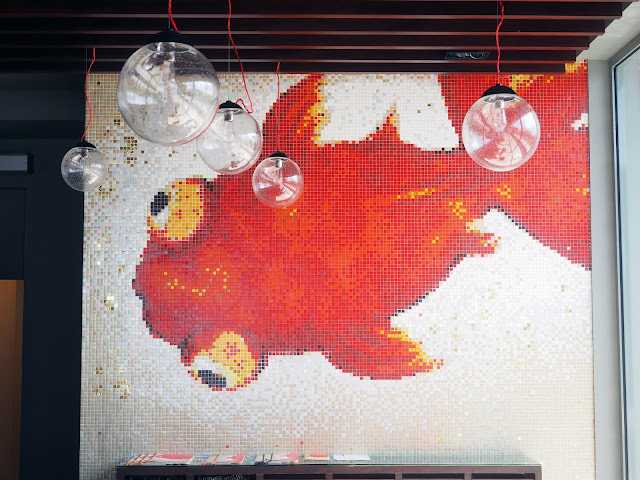 Opened in only late 2013, the hotel itself has been designed and decorated by Italian interior designer Paola Navone, and is styled based on contemporary Thai designs, using local materials such as lobster traps, which were cleverly re-designed into ceiling fans in the lobby, and handmade tiles smashed to pieces that were reconstructed into large pylons at the entrance. Other Thai touches are found in the relaxation room, which has Buddhist inscriptions subtly painted on the ceiling, as well as the open and spacious lobby itself, which holds a centrepiece structure that is inspired by a Buddhist temple, with beautiful local flowers of different colours arranged on it like an offering. 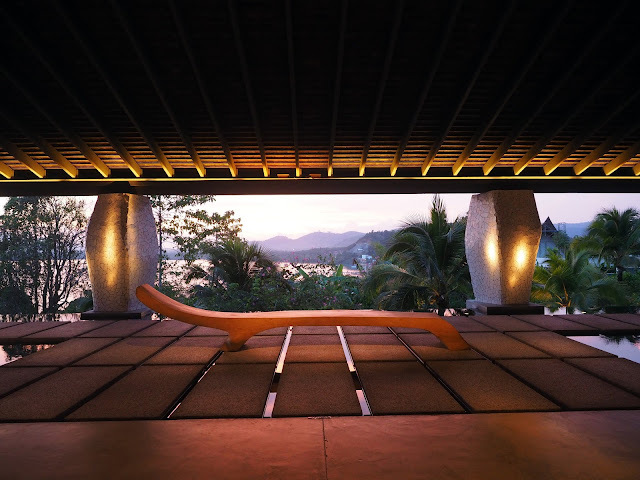 Point Yamu's design concept was to bring nature and open space into the hotel, as seen through the long reception desk and hallway benches that are actually entire carved pieces of a tree trunks taken from a local rainforest. The colours of the hotel are eclectic: the bright burnt orange touches found in Thai designs are contrasted against equally bright acquamarine colours that pay tribute to the Mediterranean. The resort has numerous room types to cater to those looking for entry-level grandeur, through to large, luxurious villas that can cater families or groups of friends. 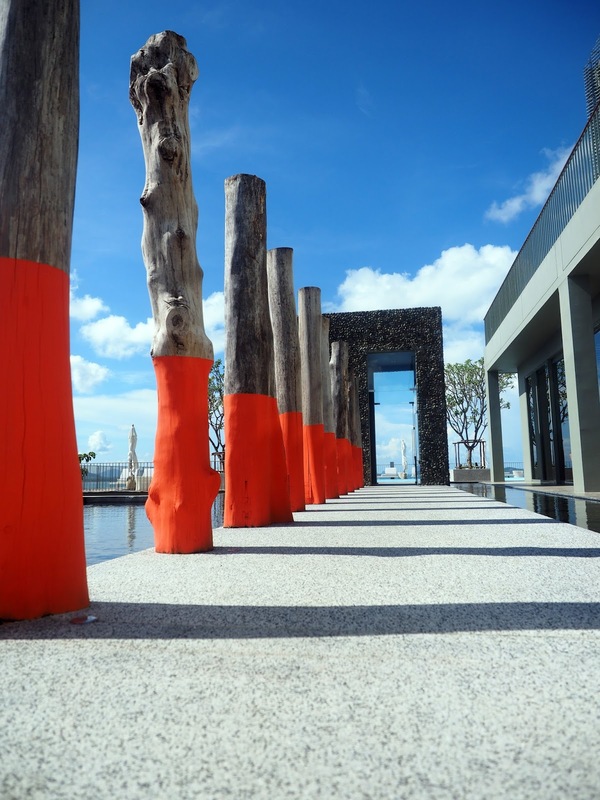 The standard room is the bay room, which is filled with natural light from the Andaman Sea. The verandah rooms are similar, with large, floor-to-ceiling windows, but the difference is that these lead out to a private verandah overlooking the water. For those wanting to splash out a bit more (so to speak), there is also the option of choosing a verandah room with a private 10 m long pool and tanning deck. This was the room we opted to stay in, and it was perfect - spacious with a contemporary Mediterranean ambiance due to the teal green and sea blue finishings, including teal ceramics made locally in Chiang Mai and a bamboo sliding door that is also crafted from local products. 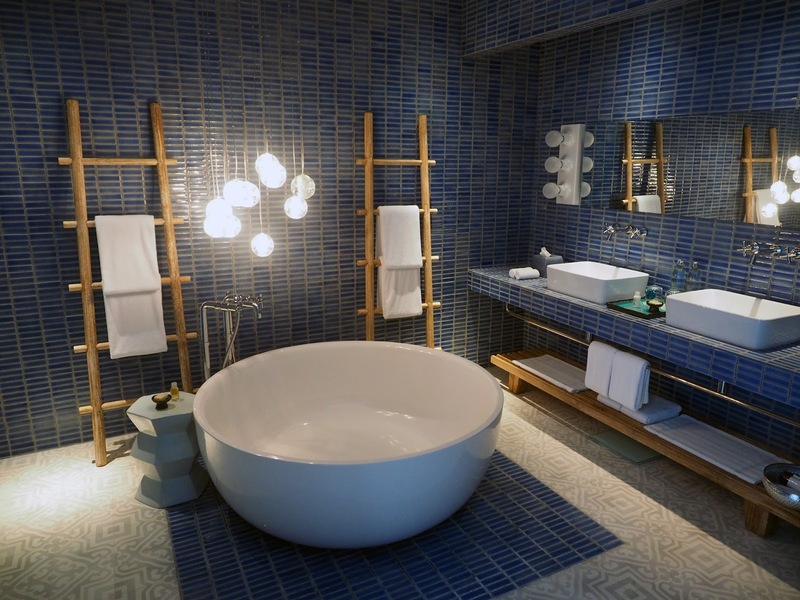 The bathrooms are spacious with separate toilet and shower rooms, along with a large bathtub big enough to comfortably fit two. What I also liked was that beside the door entrance of the room, there was an additional bathroom with a small shower hose that could be used to rinse off sand and grime before fully entering the room. 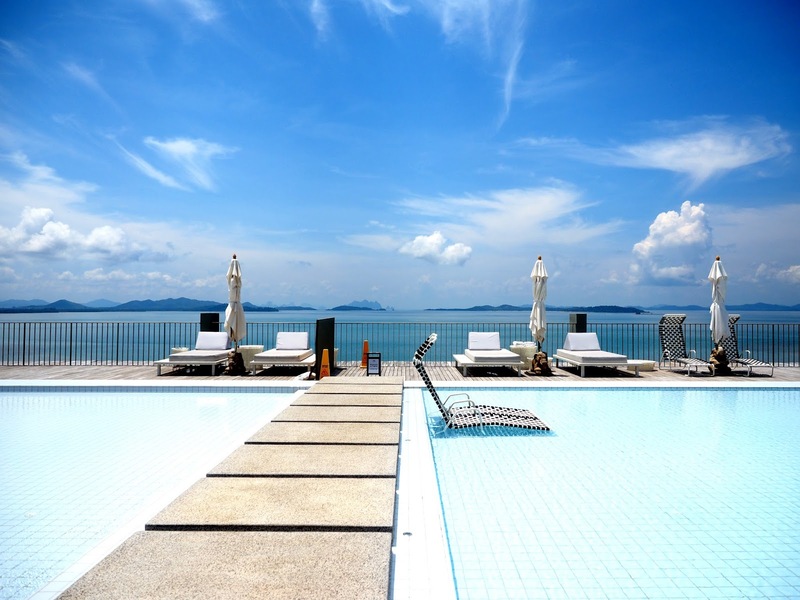 There are also bay suites and bay pool suites available, which are larger than the verandah rooms and house an indoor dining table with chairs, a separate living room, and bedrooms with balconies overlooking both Phang Nga and Yamu Bay. The turquoise and splashes of dark blue are both playful and sensual at the same time. Further up the price point chain are the verandah and verandah pool suites that have a large balcony with a queen day bed and outdoor table. Inside these suites is an additional indoor dining area for four people, and a guest powder room. 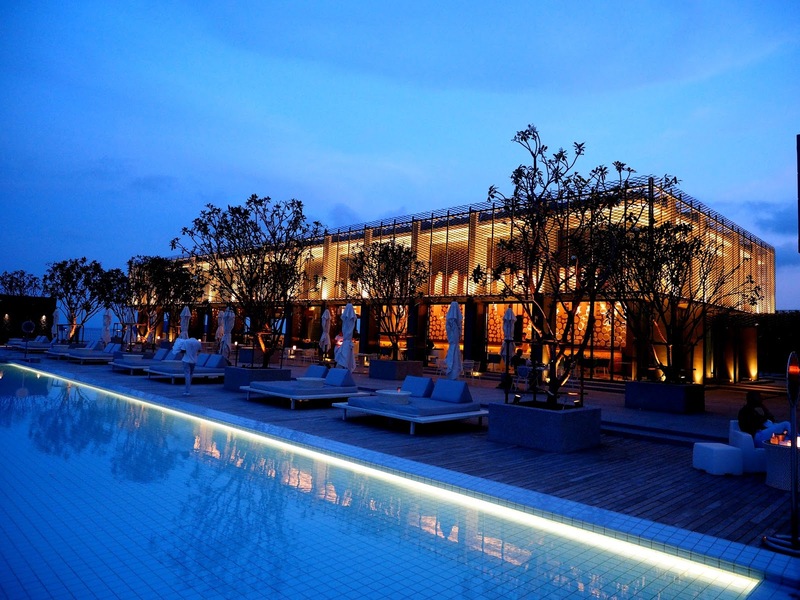 There are two restaurants at the hotel: La Sirena (the poolside Italian restaurant) and Nahmyaa (the Thai restaurant). La Sirena is designed in the same open-plan style as the rest of the hotel, with glass sliding doors that are opened so that you can drink in the poolside view. At the end of the restaurant is an open view of Phang Nga Bay, which can be enjoyed while lounging on pristine white sofas and lounge chaises and feeling the breeze on your skin. The casual beach vibe is embodied in the black and white chequered floor, as well as the teal and white chairs and table decorations that looks like something out of a Kate Spade catalogue. One wall in the restaurant is covered in white china plates of all shapes and sizes, reminiscent of Alice in Wonderland. Overhead, half the space has long white tube lights hanging from the ceiling while the other half has woven sticks in a saucer shaped lights with exposed lightbulbs. La Sirena is where breakfast is served. It is a half buffet, meaning there is a section for you to help yourself from, and there is also an a la carte menu (which you can order from as many times as you like). Service for the latter is slightly slow - be prepared to wait about 15-20 minutes for your dishes to come. On the buffet counter there are numerous fresh juices, including a deliciously thick mango smoothie and cold, refreshing Thai iced tea and coffee in delightfully quaint glass bottles with accompanying black and white straws. The fresh fruit (including mango, papaya, pineapple, and rambutan) is beautifully presented with each type of fruit placed on individual platters and covered with well designed (and remarkably aesthetic) mosquito nets. For the health conscious, there are also different yogurt jars (some pre-mixed with muesli), but if you're like me and prefer to mix your own, there are large glass jars containing different types of homemade muesli. I opt for the crunchy nut, which blends beautifully with fresh yoghurt and a dollop of honey. Around the corner is an Italian pizza station with smoked salmon and feta cheese pizza, as well as vegetarian, onion and chives pizza. I have to say, it is here that the restaurant shines: the pizzas are heated on a nearby hot stone grill and taste authentic and flavourful, with fresh ingredients generously heaped on each slice. Naturally, there is also a station with baked goods like the popular banana cake wrapped in a leaf, and your usual array of croissants and bread. On the a la carte menu are some great options. Our go-to every single day was the hokkien noodles. Despite having high standards for all Chinese meals, my boyfriend and I were impressed with the noodles that came with generously large prawns, egg, bean sprouts, basil and chilli. Although they had a slightly soup like base, they were not particularly hot or spicy, which allowed the flavours of the basil, soy and prawns to emerge. The other dish we highly recommend is the egg white omelet with braised spinach, sauteed mushrooms and a large roasted tomato. The omelet was fluffy on the inside like a souffle, and we were both highly impressed with its structure and taste. The one dish that was a disappointment was the quinoa oatmeal with fruit. I love quinoa, and I love oatmeal - but combining the two left this option tasting flat, sloppy and without any flavour. Even the fresh fruit and honey was not enough to redeem the dish. For lunch and dinner, the menu at La Sirena is Italian, with an array of salads, seafood, antipasto selection, pizza and pastas. We ordered a Moroccan curry with vegetables and quinoa, a tuna salad and steamed garoupa. The salad had small chunks of tuna on a bed of seaweed, cucumber, cabbage and avocado, and the light citrus tang was surprisingly mildly spicy. The curry was disappointingly sour and spicy at the same time, but on the upside, the textures of the cauliflower, carrot, zucchini, quinoa, chickpeas and raisins were nicely balanced. The fish came with bok choy, coriander, sliced shallots, mushrooms and soy sauce, and I was again surprised by how well they put together a Chinese cuisine dish. Despite not usually being a huge fan of white fish, this was my favourite of the dishes we ordered because the fish was evenly cooked, resulting in a tender structure without falling to pieces. The hotel's Southern Thai street food-inspired restaurant called Nahmyaa is currently only open for dinner, although some of their dishes can be ordered for room service during the day. Given the restaurant's reputable reputation, I was unsurprised to find the food was generally delicious and incredibly fresh, and the vibrant red and orange hues were warm and welcoming. We had the pleasure of sampling fresh shucked oysters with green chilli and lime with fresh herbs (THB100 each) which were fat and slightly creamy, and the accompanying garlic, chilli and spicy fish sauce created a nice balance with the texture of the oysters. While we would give the hot and sour soup (THB 300) a miss because it was far too spicy, we loved the crab curry with turmeric (THB 800), the excellent and rich massaman curry (THB 800), and the Pad Thai. The green wagyu beef curry with grilled eggplant and peppercorns (THB 800) consisted of tender meat, but unfortunately the eggplant was slightly overcooked (and soft as a result) and the curry was slightly less creamy than expected. This was compensated for by the wagyu beef sirloin with smoky tomato and tamarind dipping sauce (THB 1,200), which sadly only had four pieces of beef despite the price. What the dish lacked in quantity, it made up for in quality, with the smokey flavour so delicious that there was barely even a need for the equally well done tamarind sour sauce. 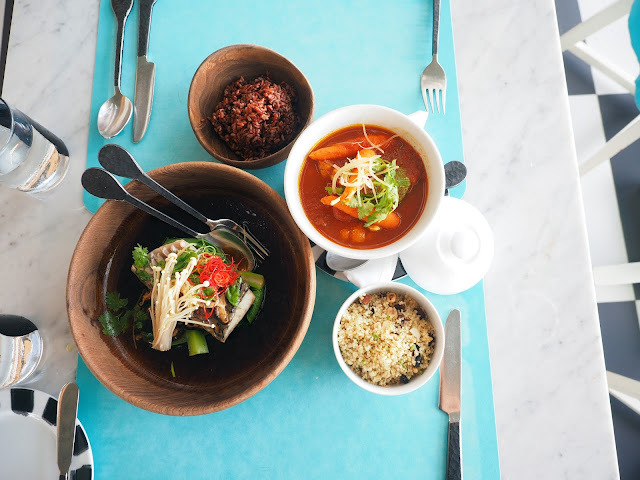 For our healthy fix, we picked the wok fried morning glory with fermented soy beans, garlic and chilli (THB 280) that we loved; and to balance out that healthy choice, we chose the sweet mango sticky rice, a classic and refreshing way to end the meal. Other dishes that are popular include the whole garoupa fish (which can be steamed, grilled or fried), river seafood like crabs and prawns, and noodle dishes. In the afternoon, the hotel has a cute ice cream cart station where you can purchase nitro ice-cream that they make fresh in front of you. There is only one flavour and it changes every day - we tried the green tea and the vanilla. While the ice-cream is good, it's the (unlimited) toppings that really tickle my fancy - particularly the honeycomb crumble and the chocolate balls. Next door to the cart are mysterious red wooden doors with a large hand on the outside. 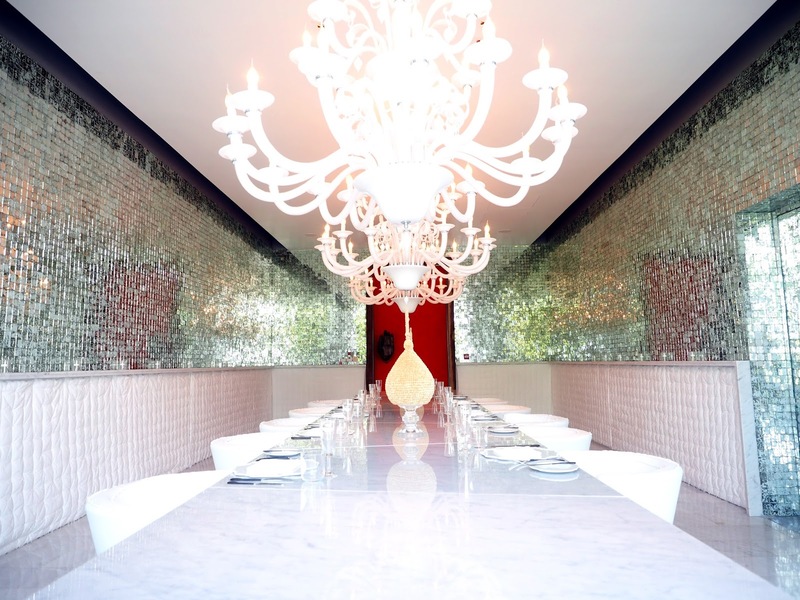 For those who are wondering, inside s a beautiful and elegant private banquet room that can cater 10 people, and is perfect for anyone looking for a place to celebrate a special occasion with a group. Finally, wine-lovers like myself will be happy to hear that happy hour at the poolside Acqua Bar is from 4-8 pm (and the bar closes at midnight) where drinks become buy one get one free. Although we sadly missed this time period (having so many other things to occupy us with), we did see quite a few guests enjoying a tipple at the bar with a perfect view during the sunset. It was a stressful week at work for me, and my boyfriend pulled out all stops to make sure I enjoyed my time in Phuket, including booking me in for two 90 minute deep tissue massages at Point Yamu's beautiful spa. With eight spacious treatment rooms (including rooms for couples) and four alcoves for Thai massages (which are performed on mattresses on the ground, Japanese style), as well as steam, sauna, outdoor pool and jacuzzi facilities, the spa is well equipped. I loved the acquamarine colours of the spa, which instantly reminded me that I was far from the chaos and pollution of Hong Kong, and the combination of the wafting small of lemongrass and soothing tranquil music calmed my nerves. 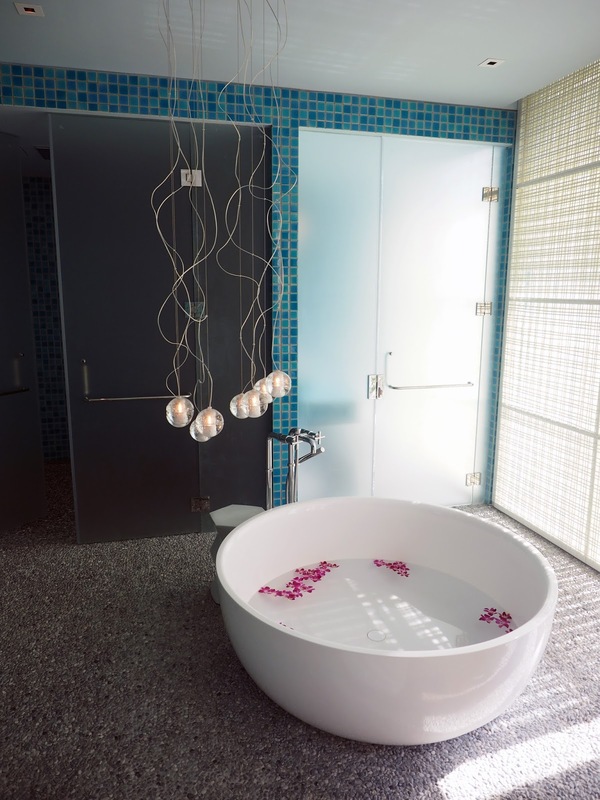 The spa treatment rooms are incredibly spacious, with a white round tub in each, filled with floating purple flowers. The bubble shaped lights were also a quirky touch. The 90 minute deep tissue massages were heavenly, with the therapist gently washing my feet to begin with, before I clambered onto the massage table and entered a state of bliss as she worked firmly to loosen up the knots all over my body. The first time I had this massage, I fell into a light slumber - something that is a rarity for a borderline-insomniac like myself! 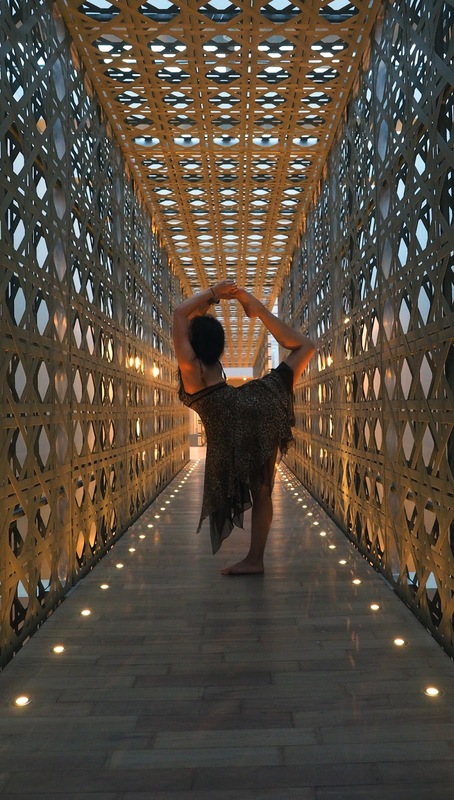 In line with Como's traditional wellness and health philosophy, the resort offers complimentary daily yoga and pilates classes (which require advanced booking). The classes are intimate with around 8-10 people in each, guided by an instructor who has been trained by Como's head fitness and yoga curriculum director. There is also a gym with standard running and weights equipment, and three outdoor pools down by the restaurants. In addition to the in-hotel activities, Point Yamu also arranges bicycle tours of nearby areas. To be frank, we were expecting a rather short, leisurely ride, but the ride turned out to be fairly difficult because of the rolling hills and traffic (as you ride on the road) and we covered 21 km of hilly distance in a bit over an hour. I'd consider myself a decent enough bike rider having done mountain biking camps before, but there were times where I didn't have the energy with the humidity and heat to get up the steep hills near the resort. Despite this, we had a great time and stopped by a nearby market and rainforest plantation (the latter filled with cheeky monkeys) before making our way back to the hotel. Although Point Yamu does not have its own private beach just yet (with the opening of an exclusive beach facility including a salt water pool, cabanas and water sports only 20 minutes away anticipated in September this year), free shuttle buses running twice a day (at 10 am and 1 pm) are operated to take you to a nearby ferry pier, where you can hop on a speedboat for a 15 minute ride to a nearby public beach called Rang Yai Island. Although the strip of beach itself is not particularly deep, the beautiful aquamarine tone of the water more than makes up for it. Keep in mind that the tide can get quite strong, so be prepared to end up a fair distance away from where you first got into the water! The hotel boys bring along towels and water for you, so there's no need to pack anything other than your swimsuits, sunscreen, sunglasses and a book. Given Point Yamu's isolation, be prepared to eat most of your meals at the hotel, although we were told there is another Thai restaurant down the road about 10 mins walk away. 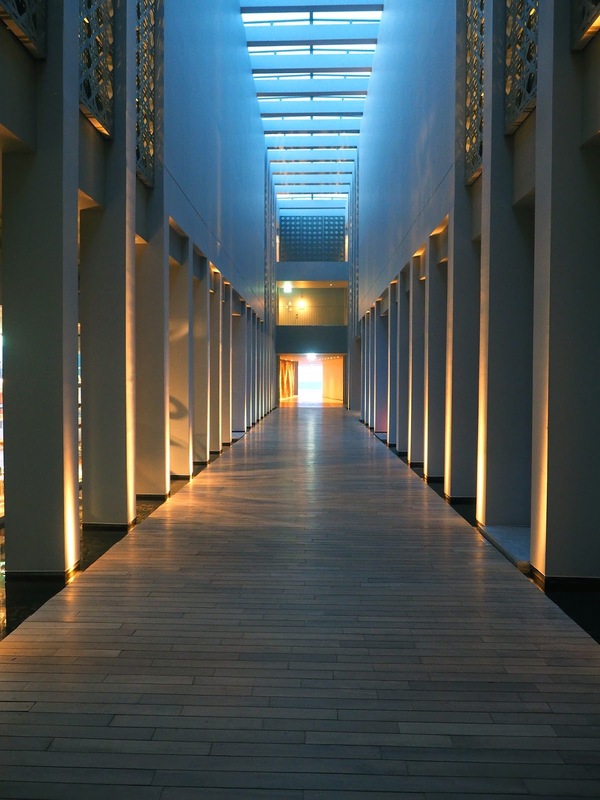 Again, because the hotel is somewhat isolated, if you are planning on going out to the city centre, take a full day trip to make it worth your while. Definitely book in advance for the hotel's activities like the yoga, pilates and bicycle tour because these get full surprisingly quickly.